Welcome to the website for the Garderie Mont Ste-Marie Daycare center! The daycare center is located four minutes from downtown Edmundston at 641 Saint-Françis Street. It is situated on a scenic and beautiful property 200 meters from the main road. Come see it for yourself! Our priority is to ensure that the daycare environment provides each child with the opportunity to develop his social, physical and emotional well being. Under the guidance of competent staff members, children are encouraged to explore and learn new skills as well as to understand and respect his limits. 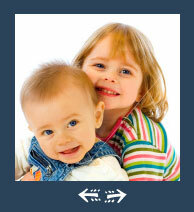 We consider each child to be a precious treasure and treat each one as if they were our own. The daycare center is a non-profit organization registered with the province of New Brunswick. It is managed by a board of directors and a general manager. The members of the board of directors are parents who have children enrolled at the Garderie Mont Ste-Marie which ensures that the needs of children and staff are always a priority.